Summary: From Chris Grabenstein, the bestselling author of Escape from Mr. Lemoncello’s Library and co-author with James Patterson of I Funny, House of Robots, and Treasure Hunters, comes a hilarious illustrated series about all the wacky things that happen when you live in a motel! Over the past few years, there are few middle grade authors that I appreciate as much as Chris Grabenstein. His books are both smart and funny, and ones that I guarantee parents and kids alike will love! 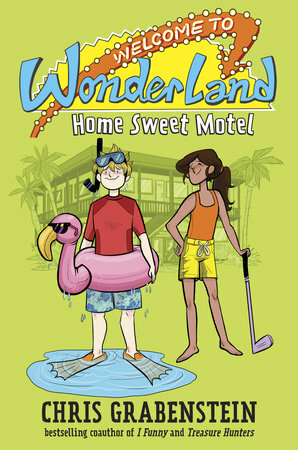 His latest is WELCOME TO WONDERLAND #1: HOME SWEET MOTEL, and it's the first in the new Welcome to Wonderland series. I loved HOME SWEET MOTEL and can't wait to see what's next! HOME SWEET MOTEL tells the story of P.T. Wilkie, an eleven year old boy who is a terrific storyteller and just happens to live in a run down hotel in Florida. His grandfather's hotel used to have some fame, but now that darn mouse and his amusement park get all of the tourists. P.T. still thinks that living in a hotel is pretty darn cool. He has a big pool, all you can eat ice cream, snack and soda machines, and he gets to live with his eccentric grandfather, the man behind the Wonderland Motel. However, his mom is feeling the financial pressures of having a hotel that doesn't have customers; and P.T. wants to help save his home. Thankfully, P.T. makes a fast friend when Gloria checks into the hotel with her father. P.T. definitely takes after his grandfather in coming up with creative ways to save the motel, while Gloria is more pragmatic -- she can monetize almost any zany idea that P.T. comes up with. The two find some success with their promotions including poolside karaoke with a singing frog and a unique scavenger hunt. Things become even more complicated for P.T. and Gloria when two jewel thieves check into the motel. These two men have been recently released from prison and they are back at the Wonderland looking for jewels that they left here many years ago. Cha Ching! P.T. and Gloria decide that if they can find the jewels before the two thieves, then they can save the motel! I adored HOME SWEET MOTEL! It is an exciting story filled with lots of action and tension; however, it's also a funny story about friendship and creativity. I absolutely loved P.T. and Gloria (and even P.T. 's unique and oblivious grandfather), and I think Mr. Grabenstein is definitely onto something with this setting and these characters. I am a big fan of mysteries, and I appreciated that there was definitely a big mystery element in this novel. I almost thought the premise of these two kids trying to save the motel provided enough adventures for the novel; however, the addition of the two jewel thieves brought the story to the next level. I loved these two kids putting themselves at risk with these cagey characters for a greater good! Another fun aspect of this book is the inclusion of black and white cartoon sketches. They are so cute and totally capture the essence of the corny decor of the hotel. They also included word bubbles which added to the humor in the story. I especially loved the chapter dividers -- flamingos! The book is hilarious, but it isn't all fun and games! There are a few serious issues introduced which I suspect might be delved into in future books. P.T. 's father is MIA and my heart went out to him. His mother is also extremely stressed while trying to be a parent and run a failing motel. These issues weren't huge downers at all, but they did make the characters a bit more human. Overall, I adored HOME SWEET MOTEL and I can't wait for the next installment in the series -- BEACH PARTY SURF MONKEY! I've only read one of Grabenstein's books and it was great. I'd definitely like to read more of his books. This sounds fantastic! I love Chris Grabenstein's books!